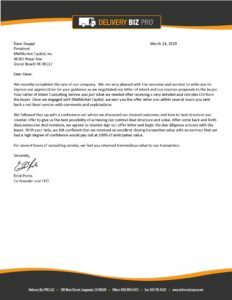 Have You Received a Letter of Intent to Buy Your Company? We Can Help You Write a Competitive Counter Offer. Your emotions have probably shifted from giddy anticipation to anxiety as you look at a document that is complex and technical and contains several terms that most business owners are not familiar with. Such thoughts as, “Am I getting a fair deal?” What is a subordinated seller note? What does a cash free, debt free transaction mean? How is a net working capital surplus calculated and what are the implications for what I receive at closing? What are all of these reps and warranties? Is a non-compete standard procedure? Mistakes in negotiating this very important document can cause the seller to lose hundreds of thousands, to millions of dollars depending on the size of the transaction. The other result is that after three months of grueling due diligence, the buyer interprets their intentionally loose wording in the LOI, in their favor, and then calls in their very expensive CPA firm and Law Firm to support their claim. The business owner faces a big haircut as these interpretations are captured in the purchase agreement. What very often happens, however, is the owner walks away from the deal. This is a big loss for everybody. Because our main business is Sell Side M&A we are able to simulate the competitive spirit of the market in spite of having a single buyer. We are able to act as the ‘Market Backstop” to your unsolicited offer and create a competitive bid. Our hourly consulting service is based on 20 years of experience in negotiating deals with the toughest buyers in the world, Private Equity Buyers. We help to balance the deal experience scale between the buyer’s team and the seller’s team. Our approach is to negotiate the LOI so that there are no unexpected surprises or haircuts at the end of due diligence. We incorporate very specific wording with formulas and examples that cannot be interpreted in the buyer’s favor no matter what big 5 accounting firm or major law firm they bring in. This results in the terms and conditions negotiated in the Letter of Intent become the terms and conditions translated into the purchase agreement. We help you get your good deal across the finish line. Since publishing our Book, Selling your Software Company – An Insider’s Guide to Achieving Strategic Value Click Here For Our New Book on Amazon our volume of inbound inquiries has more than doubled. What has surprised us is the number of calls we are receiving where the business owner either has a Letter of Intent (LOI) or is about to receive a letter of intent from the buyer. In the past, we would suggest a full Merger and Acquisition Process. After many inquiries, what we discovered was the business owners just wanted to see how this offer pans out and they wanted our assistance. 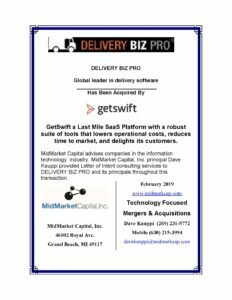 We launched our letter of intent service late first quarter 2018 and the response has been tremendous. Please let us help you maximize your opportunity.